It is my honor and pleasure to induct Swedish discus thrower Ricky Bruch posthumously into the 70’s Big Hall of Fame. Ricky Bruch had man battles throughout his life, yet he passed away on May 30, 2011 after his toughest battle, pancreatic cancer. He was 64. Björn Rickard “Ricky” Bruch was an exceptional athlete, but failed to achieve the highest gold medal honors in international competition. Bruch placed 8th in the 1968 Olympic games in Mexico City with a discus throw of 59.28m. He won a bronze medal in the 1972 Olympic games in Munich with a discus throw of 63.40m but also equalled the world record in June 1972 with a throw of 68.40 meters. Bruch was also an outstanding shot putter with a lifetime best of 20.28 m and a bronze award from the European Championships in 1971. Bruch made it to the next Olympic games in Montreal (1976), but did not make it past the qualifying rounds, an event that would spark his legacy. This failure set Bruch off, inspiring him to train harder than ever. He trained with tenacity and maniacal intensity for the 1984 Olympic Games in Los Angeles. However, he was snubbed by the Swedish Olympic committee from competing. Bent on revenge, Bruch continued training and entered smaller competitions. Eventually in November of 1984 he set a new World and Swedish record with a 71.26m discus throw at 38 years old. This throw allowed Bruch to prove to himself, Sweden, and the world that he was the greatest thrower since the throw would have won the 1984 Olympic gold medal by nearly five meters. That throw places him 9th in the all-time list and still stands as the Swedish record today. Some say that Bruch toed the line of insanity. That may be true, but his insanity was funneled into a supreme focus: to be as great as he could possibly be. This focused intensity inspired many, including this website, to devote to a mindset of success that brushes the realm of recklessness. Bruch was note solely a work-a-holic, he enjoyed himself along the way. Bruch has written a biography Gladiatorns kamp (The Gladiator’s Battle, released in 1990) and was the star of a documentary Själen är större än världen (The Soul Is Greater Than the World). After a life of battle, rest in peace, and welcome to the 70’s Big Hall of Fame. 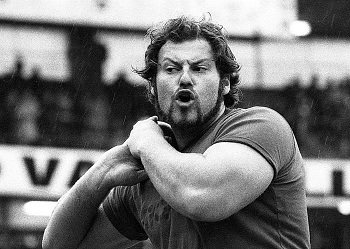 Ricky Bruch is a massive inspiration for me to become 70s big, I plan to start Shot-Putting in 2013, until then I am working on strength.